This Homemade Sidewalk Paint is so easy to make and is eco-friendly too! You can make it in different colors and it wipes right off with water! 1. In a small container mix the cornstarch and water. Add food coloring. Repeat to make as many colors as you can. If you want white paint don't add any food coloring! You'll notice when you paint it looks a little watery, but when it dries the colors will be vibrant. 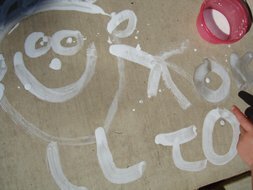 If you are using this paint outside on a warm sunny day it will dry almost immediately. Hose it off, or just use a wet rag. Since this paint is made with natural ingredients it will not harm your plants, grass, or any of your outdoor drains. Happy Painting!